Image © DC Comics. Written by G. Willow Wilson, art by Xermanico, colors by Romulo Fajardo Jr., letters by Pat Brosseau, cover by Terry & Rachel Dodson. 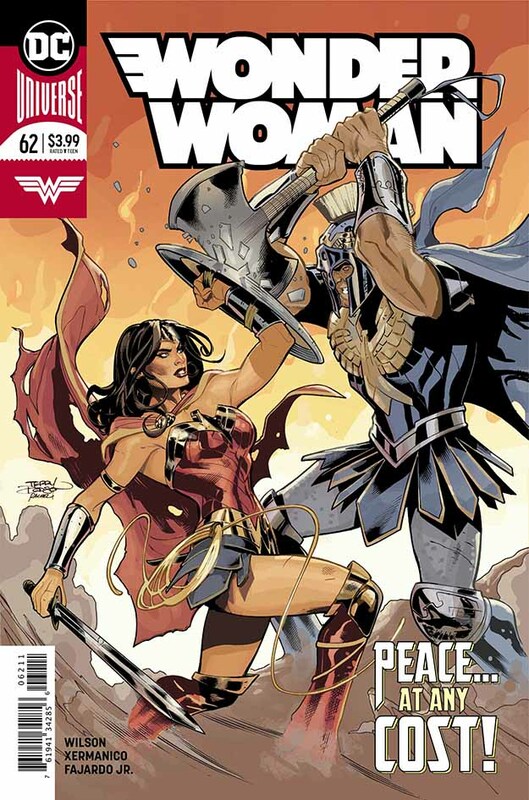 In the final chapter of “The Just War,” the Prime Minister of Durovnia has come to what Wonder Woman thought was safe territory to discuss peace in the war-torn country, only to find Ares, God of War, ready to strike him down. Diana and Ares battle, but are halted by Aphrodite. Can Love conquer all? Read the issue to find out! I have been liking Wilson’s dialogue more and more as I read this story arc, and like it best of all this time. As Diana and Steve Trevor head back America, separately, I’m curious to see what’s next. The art in the book is also appealing, and I see no reason not to keep reading this series. This entry was posted in Comics, Reviews on February 12, 2019 by Todd.